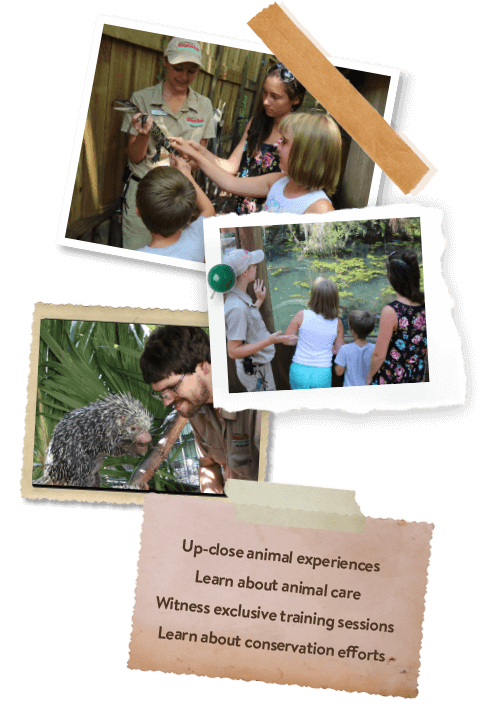 EXPERIENCE A UNIQUE FUN-FILLED “BEHIND-THE-SCENES” TOUR AT THE ST. AUGUSTINE ALLIGATOR FARM ZOOLOGICAL PARK WITH ONE OF OUR EXPERT EDUCATORS. Reserve your own personal adventure today with a Behind-the-Scenes tour at the Alligator Farm! Through this up-close walking tour, you will get to see what is “behind the glass” and learn all about the inner workings of our zoological park. Meet our smallest and newest hatchlings at the Crocodile Nursey, witness exclusive feeding and training sessions and learn all about the local and global conservation efforts the Alligator Farm is a part of! A minimum of 24 hour notice required to book. Extras: Add a Galapagos Tortoise encounter to your tour! For $10 per person, get up close and personal with some of our oldest living residents!